Beyond the Dream: The Radical Love of Martin Luther King, Jr.
We anticipate offering this course again in beginning in Aug/Sep 2018. Please contact Kingian@OnEarthPeace.org for information as soon as it is available. Connect with the philosophy and methodology of nonviolence and explore its applications for your organizing and training work today. Join in eight 90-minute online sessions to discuss the writings of MLK and others who organized and led in each stage of the Black Freedom & Civil Rights Movement. “Beyond the Dream” provides a learning cohort for organizers, trainers and educators to go deep with the nonviolence philosophy and methodology of the US Black Freedom struggle. Read and discuss Dr. King’s five books alongside writings by and about Bayard Rustin and women leaders in the movement (Ella Baker, Dorothy Cotton, JoAnn Gibson Robinson, Coretta Scott King and more). In online, listserv, and social media interactions, apply the material to your organizing and teaching/training today. Dr. King’s legacy for today is more than the “I Have a Dream” speech. King was an organizer, a radical, and a revolutionary who called the US government the “greatest purveyor of violence in the world” and demanded “radical redistribution of economic and political power.” Above all, King taught us that love is the most potent weapon at our disposal. After his assassination, Dr. King’s philosophy and methodology were synthesized by Bernard Lafayette, Jr., and David Jehnsen into a methodology called Kingian Nonviolence. 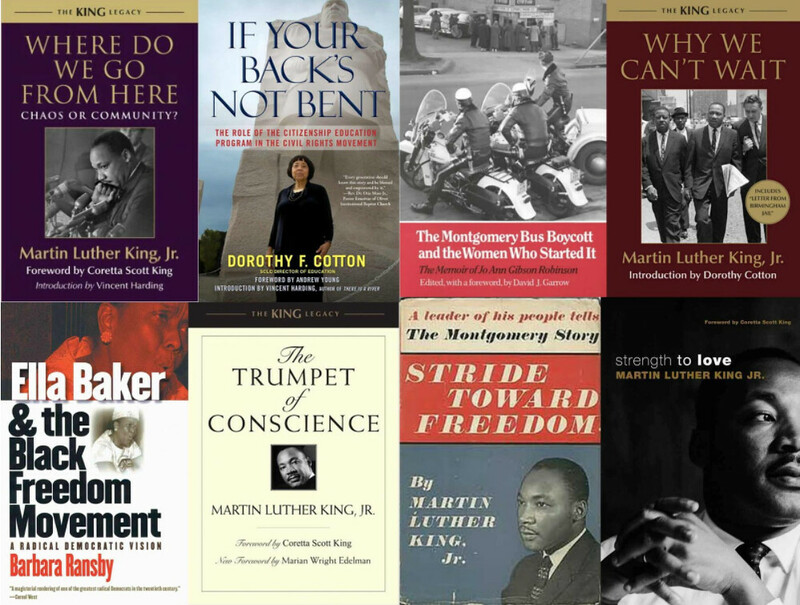 Read selections from all five books authored by Dr. King, complemented by readings by and about women in the movement (JoAnn Robinson, Ella Baker, Dorothy Cotton, Coretta Scott King, and others) and the work of Bayard Rustin. Calls are 90 minutes and start at 6pm EST (United States). Each content call focuses around one primary text book (5 by MLK and one about Bayard Rustin). For each call, we also provide multiple chapters of additional content by and about women leaders in each phase of the movement. The fee is $400. Please consider paying at a higher level if you are being sent by your employer or able to pay at a level that supports other participants and pays it forward for future programs. Context for cost: With multiple content and tech facilitators, this 5-month course takes $8000 of labor to produce. After five years of providing this work at a volunteer level, we’re trying to move toward these programs toward becoming sustainable for those in leadership. We hope you will find it accessible, and that those who are able will stretch to help make the course succeed financially. If you would like suggestions for raising money to meet the course fee, please contact us at Kingian@OnEarthPeace.org. Each participant is expected to find their own copy of each of the major texts. All main texts are widely available in public and academic libraries, and used copies are available through major online booksellers. Some readings are also available for free online. The teaching team will provide digital copies of all additional chapters at the appropriate moment in the course. The course takes places using the online meeting platform Zoom. Participants need access to a computer with speakers and a mic, as well as a stable high-speed internet connection. There is the option for a backup/secondary audio connection using the phone, but the primary connection for our meetings requires webcam.